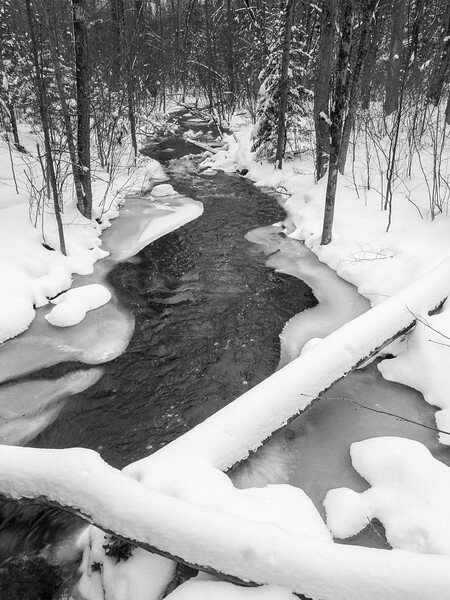 Another subject I love in winter are brooks, streams and rivers. 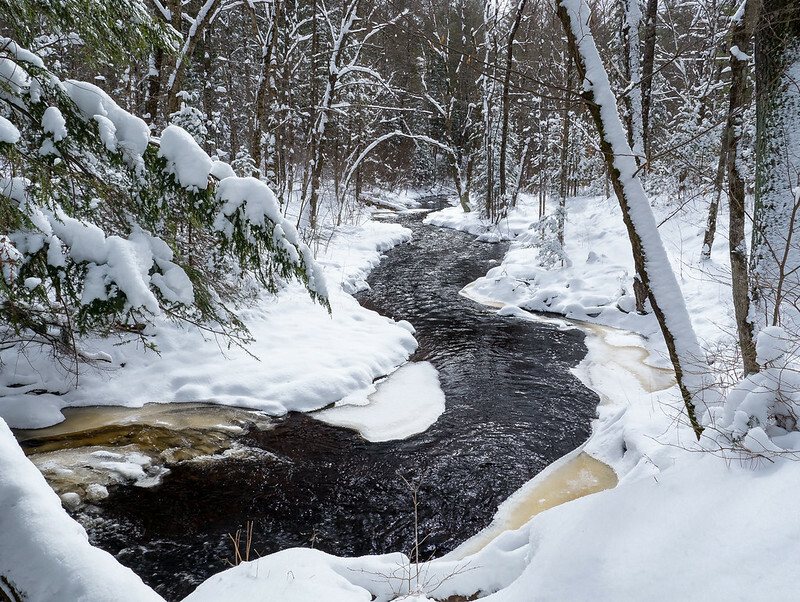 Or more properly for Wisconsin, a creek. Ripley Creek in particular. It’s a lovely, but overgrown waterway that feeds into the Wisconsin river just south of my house. The trailhead is 8 minutes away so it’s becoming a go-to spot in much the same way as Tucker and Purgatory brooks used to be for me in NH. 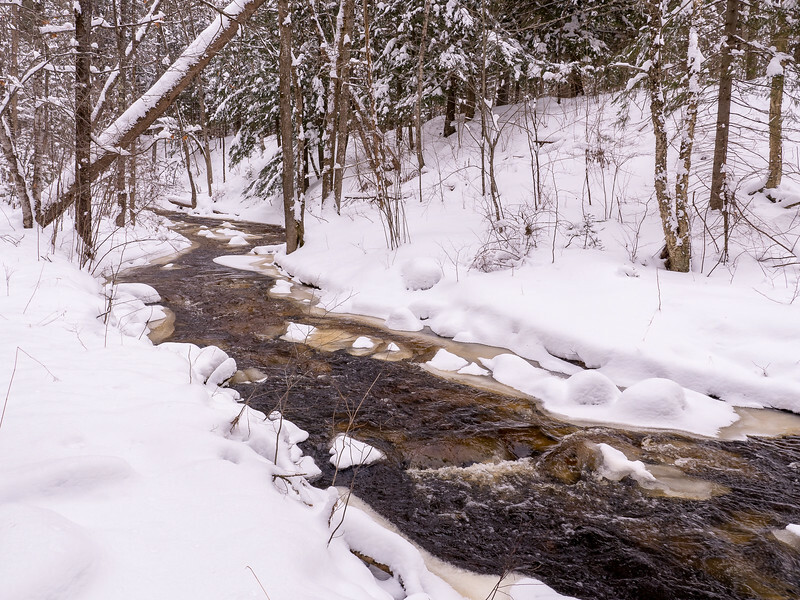 My usual approach to this kind of shot is to use a slow shutter speed and smooth the water, but this time I decided that the smooth element was already there – the snow – and so I left off the filter(s) and used a faster shutter speed. 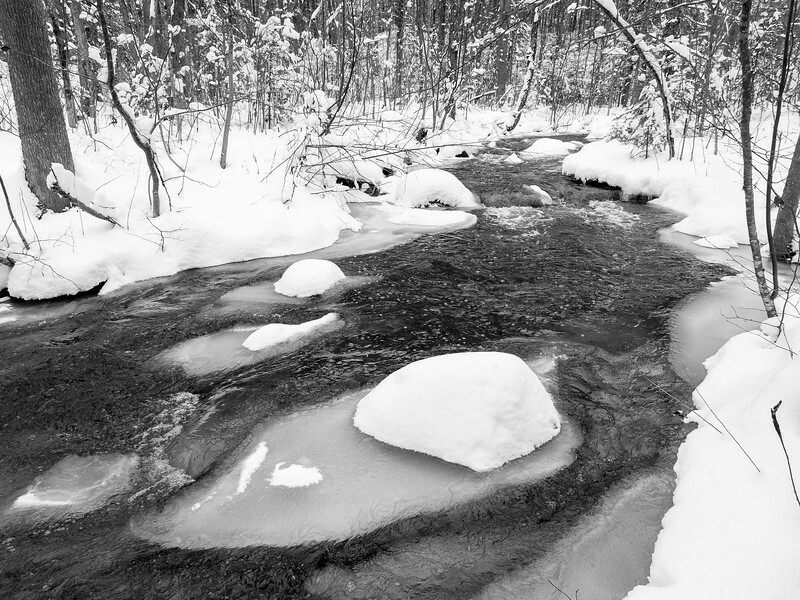 This gave me a rougher, more jagged texture in the water and that contrasts nicely with the snowy blanket on the shore. The camera was on the tripod for both those shots, but sometimes I just couldn’t get it into the right position and I had to hand hold. Luckily I could brace myself pretty well and there was enough light that I didn’t have to go to a very high ISO. I had to go for it though because of the shapes the ice forms behind the boulders. Isn’t it great? You can see that the water slows down behind the rocks and so that’s where the ice forms first. 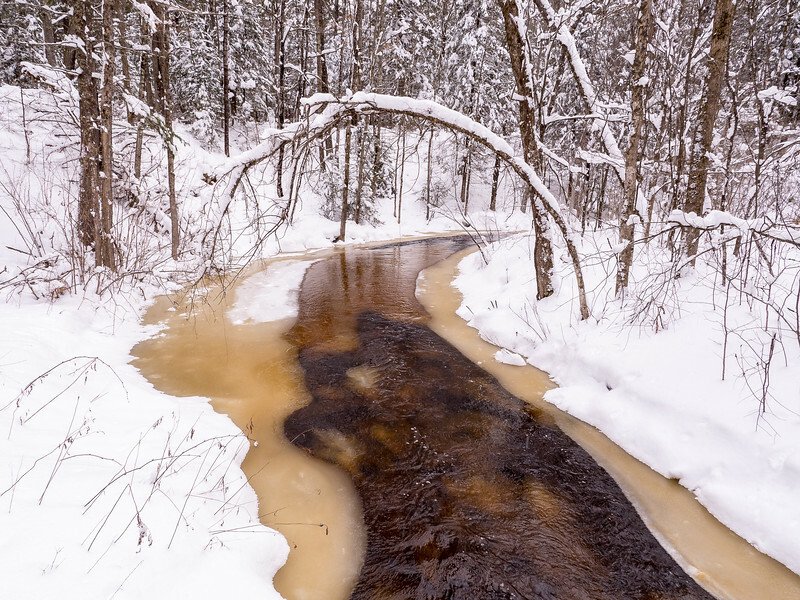 I was jammed into the branches of a hemlock sapling for this one, trying to back up enough to get the near ice formation and the right bank into the shot without getting the branches in the way. Not a bad effort and one of my favorites for the series. 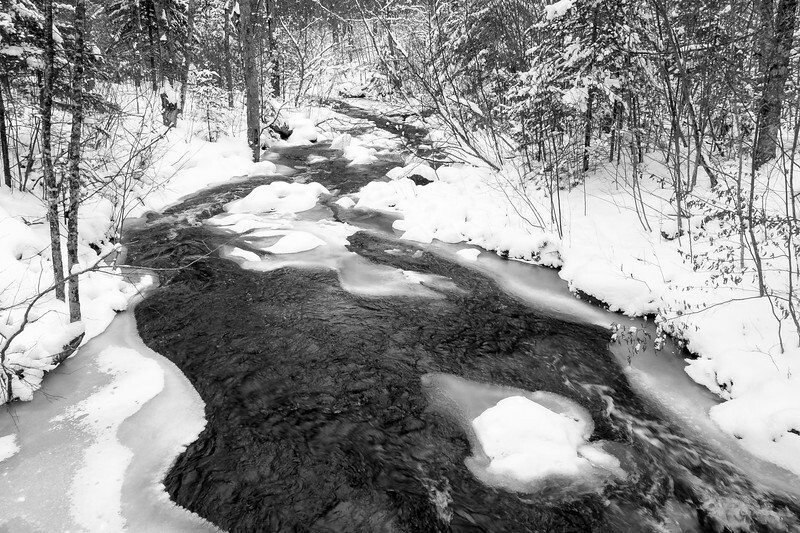 Another big choice for winter water scenes is monochrome or color. Going black and white works especially well because there is true white and true black in just about every shot (even if you do have to tweak in post). It’s dramatic and shows off the textures and contours of the landscape, which you can see here supports a lot of plant growth and is sometimes steep and rocky. The color of the water though, is part of what fascinates me about doing stream work. The tannins. Just look at that richness down there. It is most definitely not pollution. Tannins are chemical substances that come from phenolic acids (also called tannic acid) that are produced by plants. These acids are found in all parts of plants including leaves, bark and stems. As water moves through the soil the acids leach out and collect in surface waterways. They bind with starches, minerals, cellulose and proteins and are NOT water soluble and don’t decompose easily. This means those molecules are carried along in water, staining it like tea (tannins are exactly what makes tea that color). So when I like the composition and the contrast, I keep my shots in color. But when I want to focus attention on structure and line, I leach out those tannins. This last one was a little challenging in terms of getting those big logs in the foreground. My tripod was on its tiptoes (should have had the center column with me, but I didn’t) and I was on a bridge (luckily a high one), but it was close.